I have not tried polenta. Like ever. It’s always on me “to put in face list” though! And, considering I am an all the time meat eater, the braised beef is making my heart do the pitter patter. I need to eat this. And good luck with the no sugar shenanigans, that’s gotta be tough! Pinned! Are the nutritional facts listed as a per serving of each the braised beef and polenta? What are the serving size (measurements) for each? Thanks!! I will check with Lindsay on this – but I think the nutritional facts include both the meat and the polenta. LOL. I love your comment. Very respectful to your wife. Nice job! Yum! As a kid, I was weird enough that I used to BEG my mom to make me cornmeal mush, because I loved it that much. I haven’t had it in a while, so polenta is about due for a visit to my belly! Going without sugar is difficult, but sooo rewarding! Good luck! Whaaaaaaat! Delicious. Seriously. I am so hungry right now in my office. Why do I read your blog when I am starving at 10:16 in the morning and I KNOW lunch won’t be here for another 1.5 hours? Help. But the butter on that polenta… yes yes yes! Also, congrats on going for it again with the Sugar Go Free course! I was going to sign up for this round but I’m AFRAID. I love sugar so much. I will be joining Jacqueline some day in the future. Her emails have been so sweet and supportive, I know it will happen. But I’m not ready yet. Hopefully later this year. But thank you for introducing me to her! She’s a gem, that girl! We really respect way she’s been able to build such a positive, encouraging community through GSF. Mercy this looks amazing! I’m hungry just looking at it! How I love my slow cooker! My boyfriend just got into braising. Sending him this recipe right. now! Yes! This looks insanely yummy! Pinned! 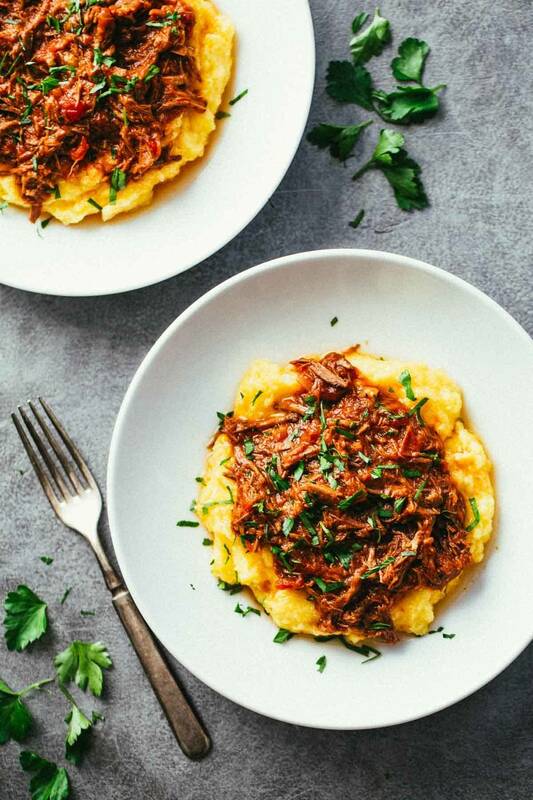 Braised beef + Tomato sauce + Polenta = ♡♡♡. Dang, this looks so good. And it is a slow cooker meal. Perfect comfy dish for these too cold for me days! I love polenta. This dish jest begs for polenta. Okay, like many others, I haven’t tried polenta either. It looks delicious though. I do love me some meat so that recipe looks amazing. Good luck on the sugar detox next week. I always tried and tried but alas, could never commit. This sounds outstanding! And I had a total “AHA” moment when you said I could make polenta. Duh I have all the ingredients why did I never think of that? Thanks! I’ve been afraid to make polenta before even though I want to try it. Now I’m not afraid to give it a try, especially with this amazing looking ragu on top. Can’t wait to see what else you’ll be cooking up! My favorite dish of the day, especially with the homemade polenta. Awesome! Oh good gosh – I haven’t tried polenta – nor is there a single beef recipe on my blog…does that mean Iam not a grown up??? Being as I’m potato nut is itggood on mashed potatoes. I have a dilemma. I’m not in the kitchen very much, to put it mildly.I don’t have a slow cooker? Crockpot? I’m 70 years old. Is it worth me getting a slow cooker and if not, howhy long would the meat have to cook, on the stove or in the oven. I love you for that description! Specifically the word snuggled. I’m literally sitting here with my mouth watering….in the midst of trying to conquer a cake, batch number two in the oven now… and making a nice healthy veggie soup for the next few days lunches…but NOW I just want some of this beef on top of polenta…we don’t make beef often here either…maybe once every couple of months…this will most definitely be the next one to try! I’m a huge fan of polenta, and it just doesn’t get it’s day in the sun as much as it should. Good on you with the no sugar plans. 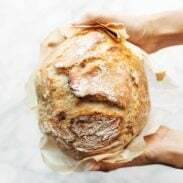 Creating recipes with a challenge is always more inspiring! Thanks Heidi! It’s one of those things where I’m like, why am I doing this again? 🙂 But I was so inspired to see how much readers enjoyed the refined sugar free recipes from this last summer, so I’m ready for round two! I serve anything braised or chili-like over a big bowl of grits! I guess I should give polenta more of a chance. And I’m not ashamed to admit that a lot of the time I also add a poached egg for extra creaminess 😀 I can’t wait to try this! That’s so funny, every time I make polenta all I can think about is how much I want to put an egg on it! Crockpot is my hero. And thank you for feeding crockpot with another delicious recipe. That’s totally delicious. I’ve never had polenta but it will be on my list to try. Love this meat how you made so good! Oh this looks so good! And crock pot too! This goes in my “recipe box” (pinterest:) Your photography is such an inspiration. Thank You. So sweet of you to say that – thanks Mary! 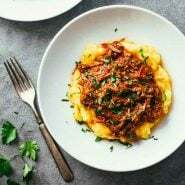 This is my kind of food love slow cooked meat and love wet polenta so double YES. I always like to add Parmesan to polenta, Cant wait to make this. So excited to hear you’ll be going sugar free again! I’m day 11 into my 21 day sugar detox, really looking forward to your recipes to help me spice things up and keep going!